The Sugarlands Distilling Company opened its downtown Gatlinburg distillery in 2014 to distill fine quality Sugarlands Shine. The authentic spirits barn-house location and first-class entertainment gives visitors a complete Tennessee moonshine experience. In addition to producing craft-quality moonshine and whiskey, guests are invited to taste free samples of authentic Sugarlands Shine and enjoy live music on the Sugarlands Spirit Stage from the Back Porch. The company is East Tennessee owned with a focus on enhancing the local community through a variety of events and charitable giving. The American Barn is the home for Sugarlands. It is made from salvaged wood from four East Tennessee barns and houses and repurposed to skin the exterior and interior walls. Each piece of wood has its own unique history. Blue and White Wood - The rustic blue and white painted wood used throughout the distillery interior was rescued from the Grey family home in the Cane Creek area of Tellico Plains. Red Wood - The signature red wood came from an old barn in the Appalachian foothills of Tellico Plains. Brown and Grey Wood - The weathered brown and grey wood covering the distillery's exterior was saved from a barn in Sweetwater. Make plans to tour the Sugarlands Distilling Company in Gatlinburg then, make reservations to claim the Ramada Pigeon Forge as your home base during your Smoky Mountain getaway. 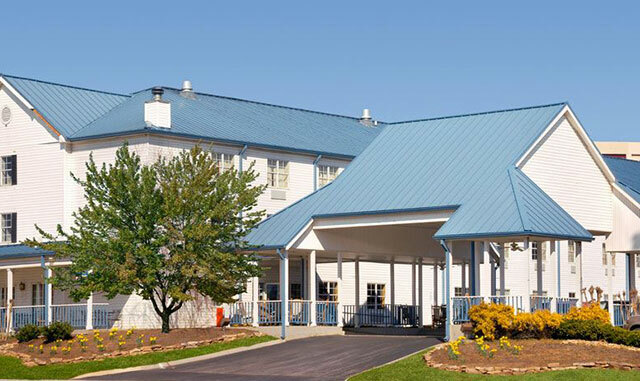 The Ramada Pigeon Forge offers all of the conveniences of home and is located only a short 10-minute drive from the Sugarlands Distilling Company and the many attractions of Gatlinburg.